The Bali Mynah is also known as the Bali Starling or Rothschild's Mynah. They are endemic to the island of Bali in Indonesia and are the only surviving species. The species is critically endangered and there are only a dozen or two individuals remaining in the wild. The remaining population is under threat due to illegal bird trade and urbanization of the island. While the wild population has been struggling for years, there are a large number of captive birds in zoos. It is also listed in Appendix I of CITIES. The Bali Mynahs are very vocal and communicate by whistling, squawking and bobbing their heads. They are the fauna symbol of Bali and locally are called kedis putih meaning white bird. This is a medium-sized stocky mynah, up to 25 cm in length. It is almost wholly white and has a long drooping crest. Black tips occur on the tail and wings. 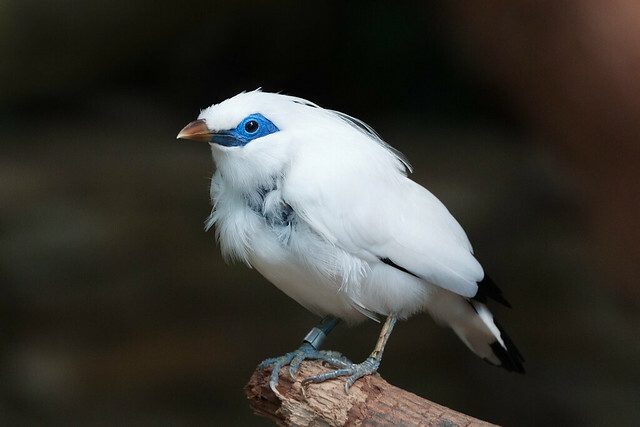 The Bali Mynah shows distinctive bare, blue skin around the eyes. It has gray legs and feet and a yellow bill. Sexes are similar. They weigh 90 to 100 gm. The Bali Mynahs eat fruit, seeds, and a variety of invertebrates. In dry seasons they will feed in groups. Bali Mynahs will live in small groups in the forested region of Bali. Groups help them protect themselves from their predators, including snakes, lizards, monkeys, and birds of prey. Nests are built in tree cavities. It takes about two weeks for the pair to construct the nest from bark, leaves, and grass. In the wild, breeding season is in the rainy season which falls between November and April. A pair will produce two to three clutches per season. Clutch size is usually 3 eggs and incubation takes 13 to 14 days. The bluish-green eggs are incubated by both parents. The young Bali Mynahs will fledge in 15 to 25 days, but continue to be fed by both parents for a few weeks. Tony has been writing articles online for the past several years.